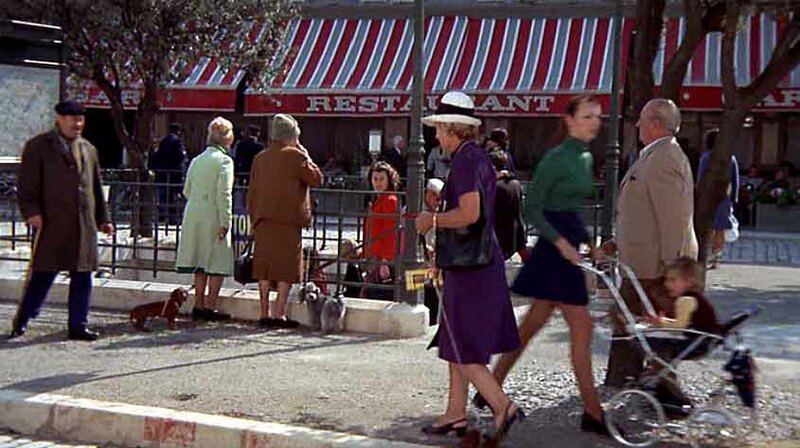 A bus crosses the frame from left to right and we follow a woman in red walking from right to left, who stops to get a magazine. 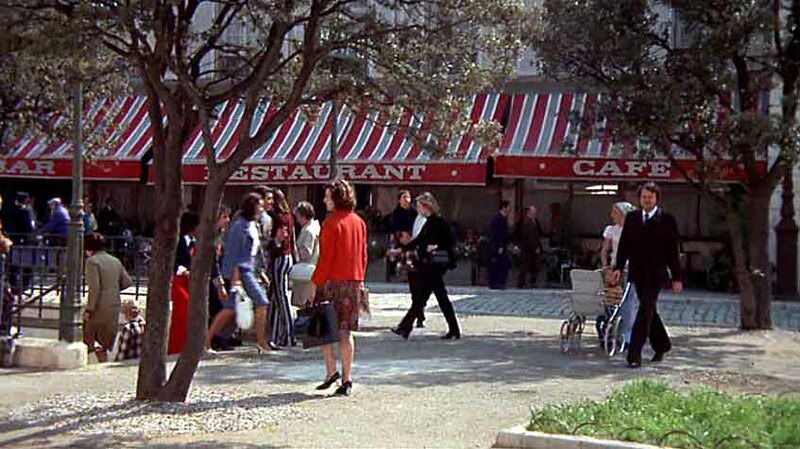 Notice the curves and circles that establish a pattern for the shot -- the curb, the kiosk, the fountain. 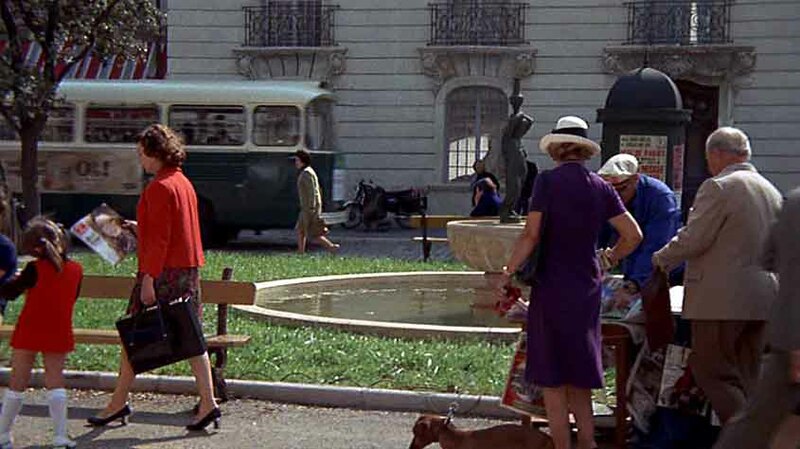 The bus re-enters in the background, driving around the circle and now moving in the same direction as the lady in red and the camera -- an indication that the shot (and the movie) will loop back upon itself. 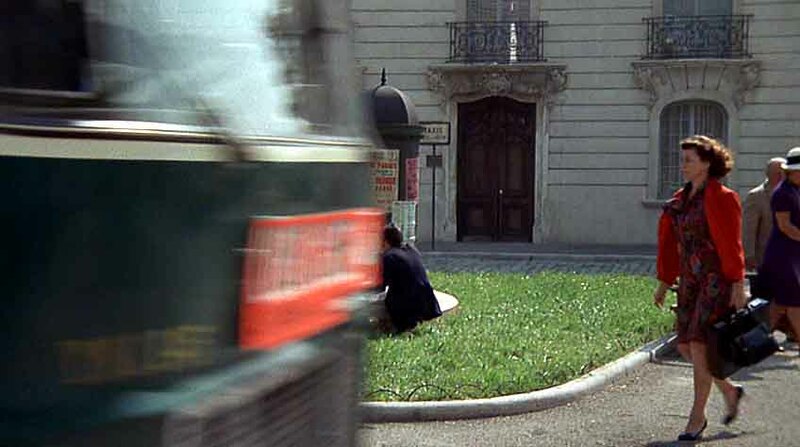 I still smile at the very thought of Francois Truffaut's opening shot in "Day for Night," the amazingly long tracking shot that gradually reveals the film-within-the-film. 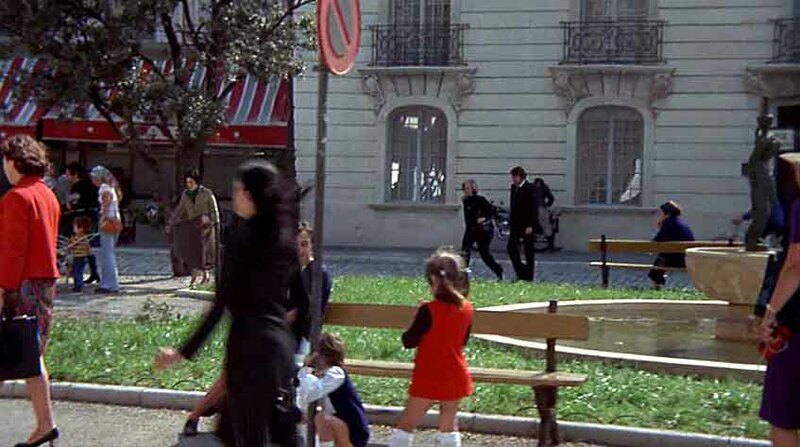 I interviewed Truffaut at the time that "Day for Night" was first released in this country. This is how he explained his purpose for making the film. "I wanted to show a film to the public about the making of a film, a film that would give the most information and from which one could learn the technical aspects of movie making. The film will help those who are thinking about making films. And, as far as the ordinary public is concerned, the film doesn't spoil anything." Still following the woman in red, a pair of figures in black appear in the background, moving forward on the diagonal, on a trajectory that just might intersect with the camera's. Will the shot turn out to be about them instead of the lady in red? Or are they somehow connected with the lady in red? The pair in black split up. The woman heads down the subway entrance -- and so does the lady in red. The man in black continues toward the camera. Are we going to meet up with this guy? During the same interview Truffaut told a funny story about "Jules and Jim" which, as he explained, he deliberately tried to make "like an MGM film." There were those who did not see "Jules and Jim" as just another MGM movie. When the film was first released here, the then all-powerful Legion of Decency (which later became known as The National Catholic Office of Motion Pictures) threatened to give it a condemned rating. 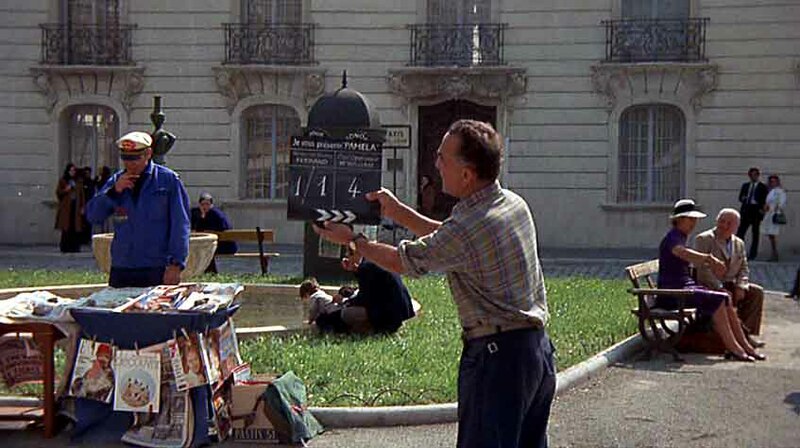 Truffaut was asked to speak to a group of priests on behalf of the film. He went reluctantly, feeling "like a little juvenile delinquent." Nope. The man in black falls out of the frame and the lady in red descends into the subway, casting a (fond?) look back as she leaves us. We fix upon another lady, one we saw back at the magazine vendor, walking a dachshund. "Do you realize the girl in the film is behaving like Elizabeth Taylor?" asked one of the priests. "It was the time of 'Cleopatra,'" and the Taylor-Burton affair was all over the newspapers," recalled Truffaut. "I pretended that I didn't know what he was talking about." "It's in the newspapers," insisted the priest. 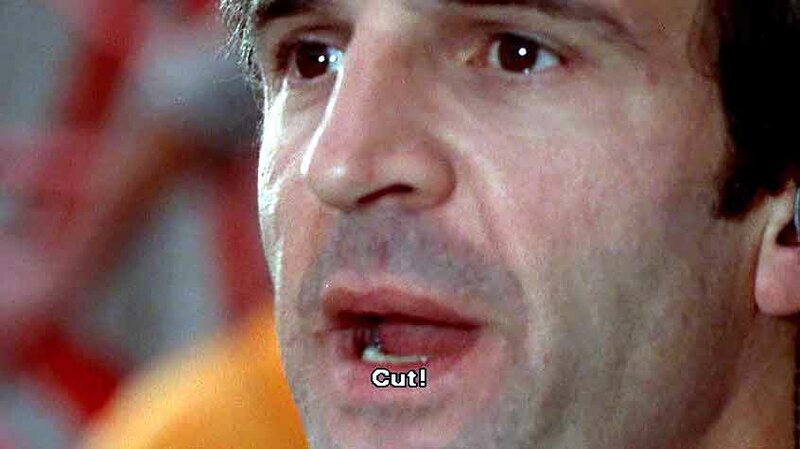 "I only read film reviews," said Truffaut. JE: Oh, Kathleen -- joy is right! This really may be the Ultimate Opening Shot in many ways, because we actually get to go back into it and critique it in the movie itself. The whole thing looks perfectly random and natural (I don't want to know how many takes it really took), as if the eye (camera) were just alighting upon one thing and then another as its interest is piqued. But we soon see how carefully and precisely it's all choreographed. Day for night. Illusion for reality. Artifice in the service of art. 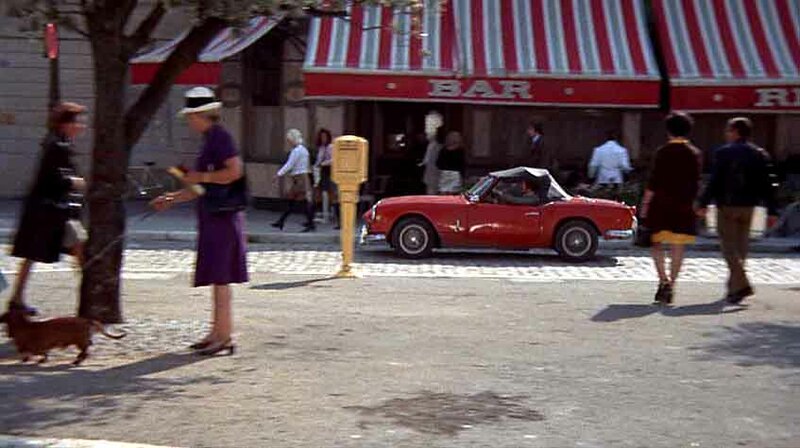 Notice, too the use of strong colors like red (dress, car, little girl, etc.) and white (car, overcoat, etc.) 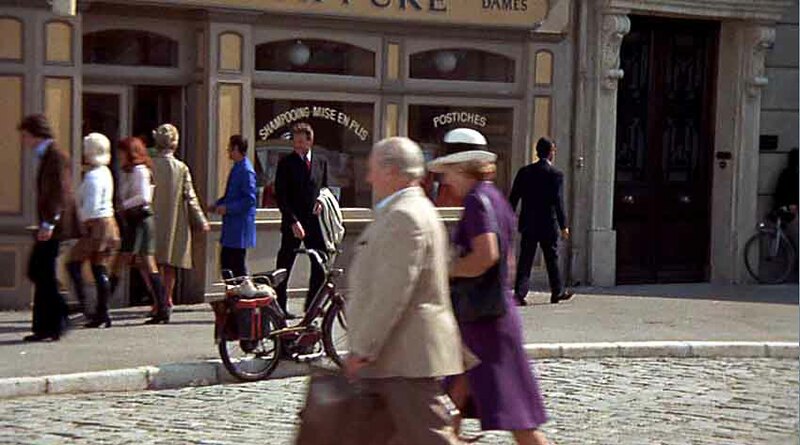 -- the alternating colors of the awning in the background -- and black (suits, car roof, etc.) to focus our attention. Doesn't this just make you want to go out and make a movie? 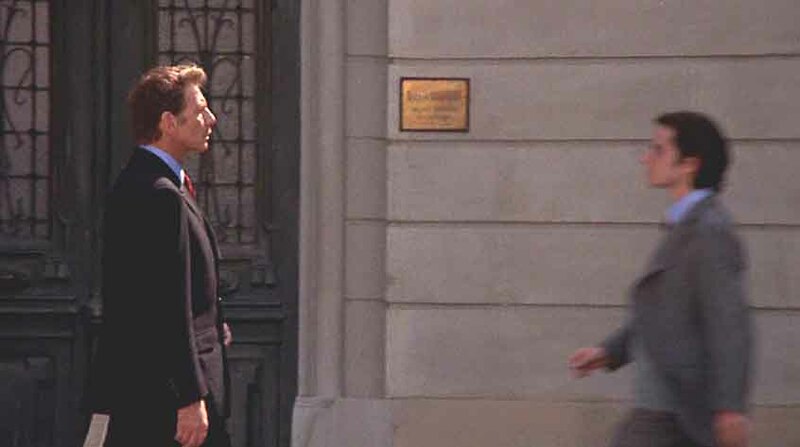 Leaud walks methodically, apparently focused on a destination that we don't know about yet -- perhaps somewhere in the space-time future ahead, beyond frame-left. (Note the reprise of the lady in red -- different lady, same red. Where is Jean-Pierre? We've been tricked! 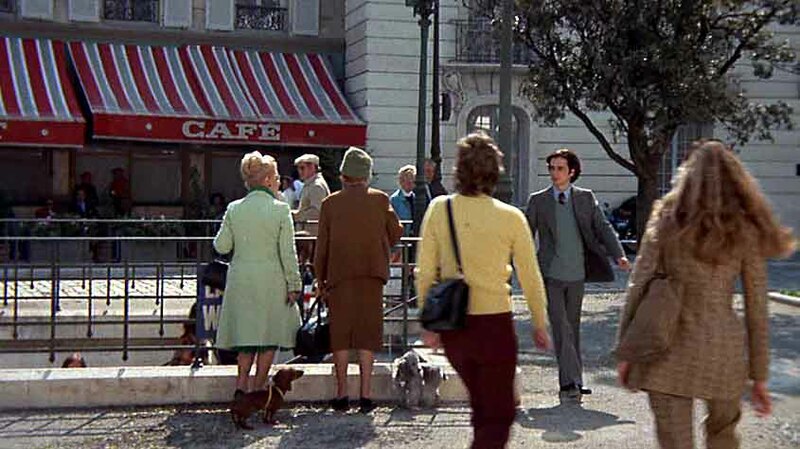 The camera moves forward without him, leaving him behind, off-frame right, while the lady with the dachshund pauses at a tree. Now we pick up on the motion of the red sports car. 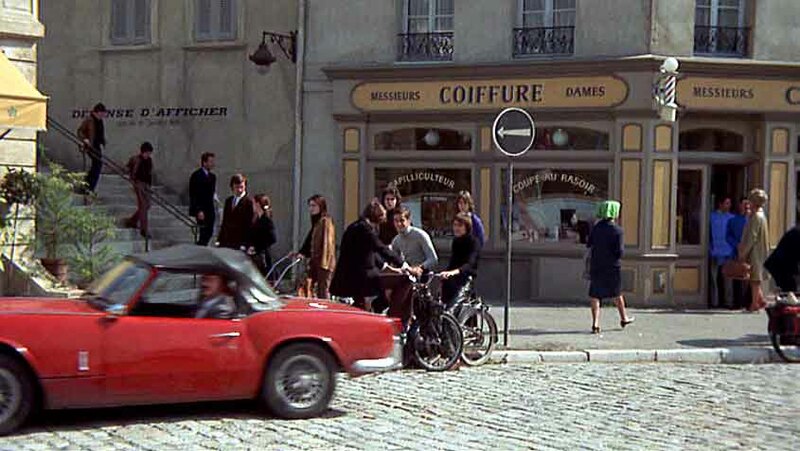 Does that car have something to do with Leaud? The red car now passes through and exits frame left, but has brought us to a stairway, which now becomes the entry point for motion coming into the frame, like a little spillway pouring energy into the shot. We've reached the far end of the roundabout, and now the "current" reverses and begin to flow from left to right (like the first image of the bus). The most prominent newly introduced figure descending the stairway into the frame is a well-dressed man with a light overcoat on his arm. 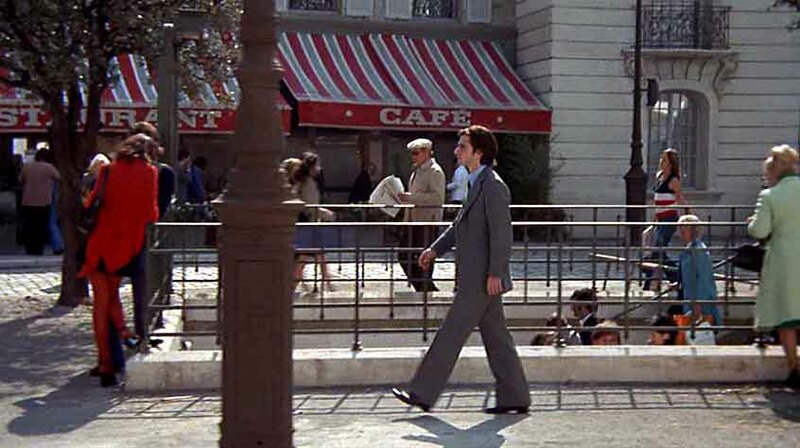 Sure enough, we pick up on the well-dressed man and follow him, reversing the direction we've been traveling up to this point, back toward the center of the roundabout. He pauses to check out some short skirts -- a humanizing moment that distinguishes him from the crowd and encourages us to fix on him. 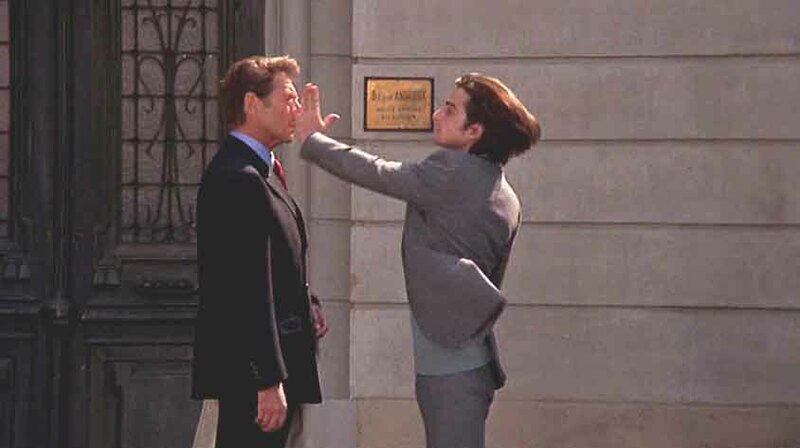 We close in on the well-dressed man (combination of zoom and camera movement) and -- whoa! There's Jean-Pierre heading him off at the pass! "CUT!" 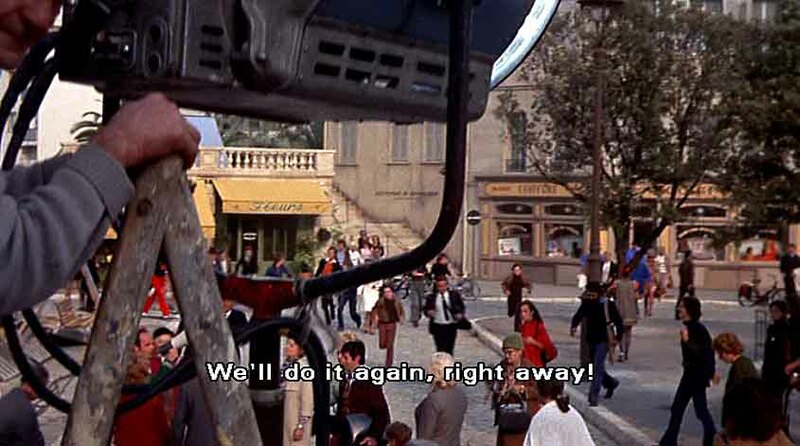 says the director of the film, and of the film within the film, played by Francois Truffaut. This quick close-up is perfect punctuation -- a proper period at the end of the long sentence that's come before. The opening shot is over, but now we get the First Assistant Director's notes and see how it was blocked and photographed. 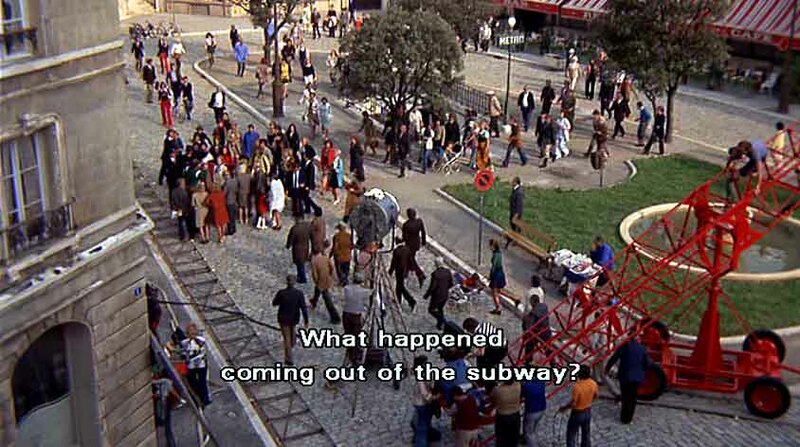 AD with bullhorn: "What happened coming out of the subway? Last time it was better. The bus was two seconds late. The background activity was late, too. By the beauty parlor, a lady was supposed to come out. I never saw the cyclist go by, either. We'll do it again. What went wrong was the beginning, coming out of the subway. Everyone came out together and then there was no one.... "